The Chinese aircraft carrier programme is the development, production and operation of aircraft carriers by China, primarily driven by the People's Liberation Army Navy (PLAN). China has had ambitions to operate aircraft carriers since the 1970s, but at that time had never owned or operated an aircraft carrier before. Since 1985, China has acquired four retired aircraft carriers for study: the Australian HMAS Melbourne and the ex-Soviet carriers Minsk, Kiev and Varyag. The Varyag later underwent an extensive refit to be converted into the Liaoning, China's first operational aircraft carrier, which also served as a basis for China's subsequent design iterations. As of 2018[update], the PLAN has a single combat-ready aircraft carrier, the Liaoning, with a second and third under construction. It is projected that China may possess five or six aircraft carriers by the 2030s. Since the 1970s, the PLAN has expressed interest in operating an aircraft carrier as part of its blue water aspirations. The first official plan of PLAN aircraft carrier development dated back on March 31, 1987 when the Commission of Science, Technology and Industry for National Defense approved the plan on the aircraft carrier and the next generation nuclear submarine for PLAN advocated and submitted by the then commander-in-chief of PLAN, Liu Huaqing. The original plan was to be progressed in stages, with basic research to be completed by the end of the 7th 5-year plan, and development of the platform and aircraft to be completed by the end of the 8th 5-year plan. By 2000, construction was to begin when ordered. To prepare the commanders needed for the future aircraft carriers, the Central Military Commission approved the program of training jet fighter pilots to be future captains in May 1987, and the Guangzhou Naval Academy (Chinese: 广州舰艇学院; pinyin: Guǎngzhōu jiàntǐng xuéyuàn) was selected as the site. However, Liu Huaqing’s plan proved to be too ambitious as the domestic Chinese industry at the time could not meet the goal demanded by the plan. As a result, the plan was drastically scaled back to basic research level and the date for an aircraft carrier entering PLAN service was postponed and eventually put on hold. In the meantime, pilot candidates for warship captain training was also altered, with candidates switched to ship-borne helicopter pilots, because it was considered that naval helicopter pilots with much more ship-borne aviation experience would be better prepared than the land-based jet fighter pilots who lack ship-borne aviation experience. China acquired the Royal Australian Navy's decommissioned aircraft carrier HMAS Melbourne in February 1985, when it was sold to the China United Shipbuilding Company to be towed to China and broken up for scrap. Prior to the ship's departure for China, the RAN stripped Melbourne of all electronic equipment and weapons, and welded her rudders into a fixed position so that she could not be reactivated. However, her steam catapult, arresting equipment and mirror landing system were not removed. At this time, few western experts expected that the Chinese Government would attempt to develop aircraft carriers in the future. After an eventful journey, Melbourne finally arrived in China on 13 June. The ship was not scrapped immediately; instead she was studied by Chinese naval architects and engineers. It is unclear whether the People's Liberation Army Navy (PLAN) orchestrated the acquisition of Melbourne or simply took advantage of the situation; Rear Admiral Zhang Zhaozhong, a staff member at the National Defence College, has stated that the Navy was unaware of the purchase until Melbourne first arrived at Guangzhou. Melbourne was the largest warship any of the Chinese experts had seen, and they were surprised by the amount of equipment which was still in place. The PLAN subsequently arranged for the ship's flight deck and all the equipment associated with flying operations to be removed so that they could be studied in depth. Reports have circulated that either a replica of the flight deck, or the deck itself, was used for clandestine training of People's Liberation Army Navy pilots in carrier flight operations. It has also been claimed that the Royal Australian Navy received and "politely rejected" a request from the PLAN for blueprints of the ship's steam catapult. The carrier was not dismantled for many years; according to some rumours she was not completely broken up until 2002. China also negotiated with Spain in an effort purchase the blueprints for proposed conventional take off/landing ships from Empresa Nacional Bazan, specifically 23,000-ton SAC-200 and 25,000-ton SAC-220 designs. Negotiations started between 1995 and 1996 but did not result in any purchase. However, the Spanish firm was paid several million US dollars in consulting fees, indicating the probable transfer of some design concepts. China acquired the former Soviet Kiev-class aircraft carriers Minsk in 1995 and Kiev in 2000. Minsk, along with its sister ship Novorossiysk, were initially sold South Korea in 1995 to be scrapped, but due to objections from environmentalists, Minsk was resold to China in 1998 to be broken up there instead. Kiev, likewise, was sold to China in 2000 by Russia with a contractual requirement for it to be scrapped. However, neither ship was dismantled and both were instead converted into tourist attractions, with Minsk turned into a theme park and Kiev a luxury hotel. In 1997, China attempted to purchase the retired French aircraft carrier Clemenceau, but negotiations between China and France failed. The 67,500 ton ex-Soviet aircraft carrier Varyag (Kuznetsov class), which was only 70% completed and floating in Ukraine, was purchased through a private Macau tourist venture in 1998. Following her troublesome tow to Dalian shipyard, the carrier underwent a long refit. Varyag had been stripped of any military equipment as well as her propulsion systems prior to being put up for sale. In 2007 there were news reports that she was being fitted out to enter service. In 2011, People's Liberation Army Chief of the General Staff Chen Bingde confirmed that China was constructing at least one aircraft carrier. On 10 August 2011, it was announced that the refurbishment of Varyag was complete, and that it was undergoing sea trials. On 14 December 2011, DigitalGlobe, an American Satellite imaging company, announced that while scouring through pictures taken December 8, it had discovered the retrofitted Varyag undergoing trials, DigitalGlobe further stated that their images captured the ship in the Yellow Sea where it operated for 5 days. In September 2012, it was announced that this carrier would be named Liaoning, after Liaoning Province of China. In September 2012, China's first aircraft carrier, Liaoning, was commissioned. On 23 September 2012, Liaoning was handed over to the People's Liberation Army Navy, but was not yet in active service. In November 2012, the first landing was successfully conducted on Liaoning with Shenyang J-15. Four years later, in November 2016, it was reported that Liaoning was combat ready. China has confirmed that it is constructing a second carrier that will be built entirely with indigenous Chinese designs. Similar to Liaoning, China's second carrier will also use a ski jump for takeoff. 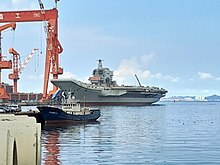 In mid-2007, Chinese domestic sources revealed that China had purchased a total of four sets of aircraft carrier landing systems from Russia and this was confirmed by Russian manufacturers. However, experts disagreed on the usage of these systems: while some have claimed that it is a clear evidence of the construction of an aircraft carrier, others claim these systems are used to train pilots for a future ship. In August, 2008, Mr. Huang Qiang (黄强), the speaker of the Commission of Science, Technology and Industry for National Defense announced to the public at a news conference that China had mastered all of the technologies for an aircraft carrier, and would build aircraft carriers in the future when the time was deemed right. Reports initially claimed that up to two carriers based on the Varyag would be started by 2015. According to the Nippon News Network (NNN), research and development on the planned carriers is being carried out at a military research facility in Wuhan. NNN states that the actual carriers will be constructed at Jiangnan Shipyard in Shanghai. Kanwa Intelligence Review reports that the second carrier to be constructed will likely be assigned to Qingdao. According to a February 2011 report in The Daily Telegraph, the Chinese military has constructed a concrete aircraft carrier flight deck to use for training carrier pilots and carrier operations personnel. The deck was constructed on top of a government building near Wuhan (Wuhan Technical College of Communication campus next to Huangjiahu). On 7 June 2011, People's Liberation Army Chief of the General Staff Chen Bingde confirmed that China was constructing its own aircraft carrier. He stated he would provide no further details until it was complete. On 30 July 2011, a senior researcher of the Academy of Military Sciences said China needed at least three aircraft carriers. "If we consider our neighbours, India will have three aircraft carriers by 2014 and Japan will have three carriers by 2014, so I think the number (for China) should not be less than three so we can defend our rights and our maritime interests effectively." General Luo Yuan. In July 2011, a Chinese official announced that two aircraft carriers were being built at the Jiangnan Shipyard in Shanghai. On 21 May 2012, Taiwan's intelligence chief Tsai Teh-sheng told the Legislative Yuan that the PLA Navy plans to build two carriers, scheduled to start construction in 2013 and 2015 and launch in 2020 and 2022 respectively. On 24 April 2013, Chinese Rear Admiral Song Xue confirmed that China will build more carriers and these will be larger and will carry more fighter-planes than Liaoning. In December 2013, China's Central Military Commission told Duowei News it planned to commission two Liaoning-pattern aircraft carriers by 2020, designated as Type 001 and Type 001A. Contracts have been awarded to China Shipbuilding Industry Corporation to build the two carriers. The cost is projected to be US$9 billion. A waist catapult could be fitted to one or both vessels to facilitate airborne early warning aircraft operation and air control. Presently Liaoning combines unassisted ski-jump launched aircraft with helicopters for anti-submarine and air defense operations. Construction began in 2013 and the ship was launched in April 2017. On 31 December 2015, a spokesman of the Chinese Ministry of Defense confirmed that China is designing and building its second aircraft carrier. The 001A is a conventionally powered ski jump carrier with a displacement of around 70,000 tonnes. It is likely to be powered by oil-fired boilers and steam turbines, though previously there has been speculation that it could be gas-turbine propelled. There are some evident differences from the Soviet built Liaoning. [clarification needed] China's first homemade aircraft carrier, Type 001A, left her home port of Dalian for her third sea trial on Oct. 28, 2018. The third aircraft carrier, known as Type 002, is to be an entirely different design than Types 001 (Liaoning) and Type 001A (Shandong). It will have a displacement of around 85,000 tonnes. In 2015, media reports stated that both an EMALS and a steam-powered catapult were constructed at the Huangdicun naval base for testing; this is thought to indicate that the Type 002 class as well as future PLAN carriers could possibly be CATOBAR carriers. The construction of the first Type 002 class aircraft carrier started in February 2017. It is claimed that there are two ships of the class are being built in Dalian Shipyard and Jiangnan Shipyard simultaneously. The Type 003 is planned to be larger than the Type 002, and also feature nuclear propulsion, which could power weapons like lasers and railguns. It is claimed that construction started in December 2017 at Jiangnan Shipyard. China initially intended to acquire Russian Sukhoi Su-33 carrier-based aircraft to be operated from its aircraft carriers. However, China later developed the Shenyang J-15 as a derivative of the Su-33, featuring Chinese technology and avionics from the J-11B program. On 25 November 2012, it was announced that at least two Shenyang J-15s had successfully landed on Liaoning. The pilot credited with having achieved the first landing was Dai Mingmeng (戴明盟). According to Chinese media reports, the J-15 cannot take off from Liaoning with a full weapons and fuel load exceeding 12 tons, being unable to get off the carrier's ski jump ramp. The Shenyang J-31 is a fifth generation fighter aircraft being developed by China that may in future be adopted for carrier use. There are unconfirmed reports of a J-15A catapult compatible fighter being tested on an Electromagnetic (EMALS type) catapult. This is thought to likely have occurred at the Huangdicun facility. The South China Morning Post reported on July 6th 2018 that China is developing a variant of the FC-31 as an alternate carrier operational jet. ^ "No slowdown for China's Navy aspirations". 23 January 2018. ^ Wang Jianfen; Nie Ligao (23 March 2009). "Japan defense minister's China visit a sign of warming relations". Chinadaily.com.cn. Archived from the original on 1 January 2018. Retrieved 10 September 2018. ^ a b c Storey, Ian; Ji, You (Winter 2004). "China's Aircraft Carrier Ambitions: Seeking Truth from Rumors". Naval War College Review. 57 (1). Archived from the original on 12 December 2006. Retrieved 30 May 2015. ^ a b Hobbs, Commander David (October 2007). "HMAS Melbourne (II) – 25 Years On". The Navy. 69 (4): 5–9. ISSN 1322-6231. ^ a b c d Hemmingsen, Torbjørg (June 2012). "PLAN for action: New dawn for Chinese Naval Aviation". Jane's Navy International. ISSN 2048-3457. ^ Lind, Lew (1986) . The Royal Australian Navy – Historic Naval Events Year by Year (2nd ed.). Frenchs Forest, NSW: Reed Books. ISBN 0-7301-0071-5. OCLC 16922225. ^ a b c d e Storey, Ian; Ji, You (Winter 2004). "China's aircraft carrier ambitions: seeking truth from rumours". Naval War College Review. 57 (1): 77–93. ISSN 0028-1484. Archived from the original on 14 June 2010. Retrieved 25 October 2009. ^ "J-8IIG". Retrieved 22 April 2014. ^ "J-8IIG trials". Retrieved 22 April 2014. ^ "Knowledge gained from J-8 used on J-15". Retrieved 7 November 2013. ^ a b Laris, Michael (25 January 1999). "China's First Aircraft Carrier Anchors in 'Fun Zone'". The Washington Post. ^ "Former Soviet aircraft carrier sold in China for $16mln". Sputnik International. 31 May 2006. Retrieved 30 May 2015. ^ Han, Ximin (4 April 2016). "Soviet-era ship leaves Shenzhen". Shenzhen Daily. Archived from the original on 27 April 2016. Retrieved 16 April 2016. ^ "中国首艘航母明斯克号起锚驶向江苏 4月下旬抵达". 扬子晚报网. 4 April 2016. Retrieved 4 April 2016. ^ "China launches second aircraft carrier after a £9.6m refit... as a luxury hotel". Daily Mail. 11 August 2011. Retrieved 6 December 2013. ^ Branigan, Tania (10 August 2011). "China launches second aircraft carrier – as luxury hotel". The Guardian. Retrieved 6 December 2013. ^ Rosamond, Jon (November 2007). "China completes joint exercise with UK aircraft carrier". Jane's Navy International. p. 6. ^ a b "PLA Chief Confirms Vessel Is 'Under Construction'". Global Times. 8 June 2011. ^ "China's first aircraft carrier begins sea trials". CBC News. 10 August 2011. Retrieved 30 May 2015. ^ "US satellite snaps China's first aircraft carrier at sea". The Guardian. London. 15 December 2011. Retrieved 30 May 2015. ^ a b ChinaPower (9 December 2015). "How does China's first aircraft carrier stack up?". Center for Strategic and International Studies. Retrieved 29 December 2016. ^ "China navy takes delivery of first aircraft carrier". 23 September 2012. Retrieved 30 May 2015. ^ a b 我航空母舰顺利进行歼—15飞机起降飞行训练. 新华网 (in Chinese). 北京. 25 November 2012. Retrieved 30 May 2015. ^ "Long-Range SAMS Deployed In Qingdao". Kanwa Intelligence Review. 10 April 2010. ^ "China needs at least three aircraft carriers: general". Spacewar. 30 July 2011. Retrieved 30 May 2015. ^ Gertz, Bill (2 August 2011). "China begins to build its own aircraft carrier". Washington Times. p. 1. Retrieved 30 May 2015. ^ Blanchard, Ben; Lim, Benjamin (27 July 2011). "China boosts naval power with carrier program: sources". Reuters. Retrieved 30 May 2015. ^ "Taiwan Says China To Build Two Aircraft Carriers". Channel NewsAsia. 22 May 2012. ^ Sweeney, Pete (24 April 2013). "China to build second, larger carrier: report". Reuters. Retrieved 30 May 2015. ^ "New aircraft carriers to be built in Dalian and Shanghai: source". WantChinaTimes.com. 11 December 2013. Archived from the original on 18 April 2015. Retrieved 30 May 2015. ^ "中国正在自主开展设计和建造第二艘航空母舰". 新华网. 31 December 2015. ^ "China building second aircraft carrier". Xinhuanet. 31 December 2016. ^ a b "China Reveals Launch Date of New Aircraft Carriers". Sputnik International. 13 February 2017. ^ "Further progress made on China's Type 001A carrier". IHS Jane's Defence Weekly. 26 September 2016. Retrieved 12 November 2016. ^ "Coming Soon: China's Navy Could Eventually Have Six Aircraft Carriers". 31 October 2018. ^ "CHINA'S NEW CARRIER GETS A SKI RAMP". Popular Science. 5 May 2016. Retrieved 12 November 2016. ^ "China building third aircraft carrier, says report". IHS Jane's. 24 February 2017. Retrieved 24 February 2017. ^ a b c Mizokami, Kyle (7 September 2018). "Inside China's Plan to Build the Second-Biggest Aircraft Carrier Fleet in the World". Foxtrot Alpha. Jalopnik. Retrieved 2 January 2019. ^ Lin, Jeffrey Lin; Singer, P.W. (16 August 2017). "China's making major progress with its aircraft carrier tech". Popular Science. Retrieved 11 November 2017. ^ Seidel, Jamie (23 April 2018). "Here's what we know about China's newest aircraft carriers". news.com.au. Retrieved 19 June 2018. ^ "China to Buy Su-33 Carrier-Based Fighters from Russia?". Defenseindustrydaily.com. 26 March 2009. Retrieved 30 May 2015. ^ "China lands first fighter jet on aircraft carrier". 3 News NZ. Associated Press. 26 November 2012. Retrieved 30 May 2015. ^ 戴明盟：着舰成功首飞第一人. 钱江晚报 (in Chinese). 杭州. 24 November 2012. Retrieved 30 May 2015. ^ Minnick, Wendell (28 September 2013). "Chinese Media Takes Aim at J-15 Fighter". Defense News. Retrieved 21 July 2015. ^ "Chinese Navy catapult and J-15A". 9 November 2016. Retrieved 12 November 2016. ^ "China's navy scrambles to replace troubled J-15 carrier fighter jet". 4 July 2018. Retrieved 6 July 2018. ^ "China's first aircraft carrier, the Liaoning". ^ Ritsick, Colin (19 August 2018). "Here Is Every One Of The Active Aircraft Carriers In The World". militarymachine.com. Retrieved 7 September 2018. ^ Liu Zhen (28 August 2018). "China's Liaoning aircraft carrier gets brand new command centre". South China Morning Post. Retrieved 7 September 2018. ^ "China's homegrown aircraft carrier Type 001A will start sea trials". 25 April 2018. This page was last edited on 25 April 2019, at 02:49 (UTC).